When I was eight years old, on an early June afternoon, another eight year old girl who lived a few miles from me was abducted on her way home from school. She was found murdered in a culvert just blocks from her house. I remember my Mom watching me walk to school the next morning, which she had never done before. I could sense her fear. It was the first time I can recall really being scared. Shortly after this incident, I had a nightmare that the girl’s killer was in my room. I dreamed that he was hiding behind my bedroom door and I was facing certain death. The murder was never solved, so I have no idea what the killer looked like. But in that nightmare, my eight year old mind had a detailed image. The murderer was Mr. Clean. In my dream, I slowly pulled the door back to reveal him standing there with a broom. Mr. Clean was sweeping my floor. It took many years before I could buy any of his products. But, those Magic Erasers? Well, they make my heart skip a beat. My point is that even rational fears can sometimes turn irrational. Some friends of ours are having a hard time with their daughter. She is suddenly terrified of tornados. Rational? Yes. When she sees a random gray cloud in the sky, she begins to freak out. Rational? No. I used to housesit for a neighbor when I was young and they had a cat that would greet me by standing on its hind legs while hissing and baring its teeth. From that experience, I grew to be truly scared of cats. Rational? Yes. When a friend's cat comes purring and rubbing against my legs, it might as well be a boa constrictor. Rational? No. I even know a grown man with a true fear of clowns. I know we're not alone. There must be at least one person out there who is scared of Aunt Jemima or who cowers at the sight of cheerleaders. I want to make our friends feel better about what’s going on with their daughter. So boys and girls…what’s your irrational fear? Also, thank you all so much for your kind words about my Aunt M. She will be missed. Here is a picture of her teaching a very young me about the finer things in life...Budweiser. What?! I do so look like a girl. Do so. Yesterday afternoon my Mom called and told me my Aunt M had passed away. It was unexpected, and as much as I tried to be strong I couldn't hold things together. My six year old son saw I was upset, came over to me and asked, "Why are you crying?" I said, "Aunt M died today. Everything will be okay, but I'm crying because I'm going to miss her. I loved her very much and I was close to her." Then he climbed up on my lap, put his nose about an inch from mine and asked, "Were you close like this?" I have mentioned before that our family is highly competitive. My husband is the worst of the bunch. Coming from a family of eleven, his sibling rivalries are taken to a much higher level. When I heard there was a movie coming out called There Will Be Blood, I thought it was a documentary filmed during a family game of Boggle. Our nine year old daughter, who used to let her friends win just to be nice, is now changing her tune. As she has gotten older and has begun to play sports, I've noted a real ruthless streak in her. Now, with a Wii in the house her new attitude is win first, friends second. Yesterday she was playing tennis with her Dad when she missed a ball and, as is customary, he began to rub it in her face. He saw the end was near and before going in for the kill he asked, "Do you smell that?" And I realized my daughter has learned the first rule of competition is knowing how to talk smack when she replied, "I smell something. But, it's not your victory." Because my six year old son has ear canals the size of a bug, and he produces a lot of wax, he has to go to the ENT roughly once a month for a thorough cleaning. In order to be proactive about it, I am always looking for signs of wax build-up. For instance, when he starts asking, "What?" all the time, I know I need to schedule an appointment. Another indication is when worker bees start buzzing about his head. 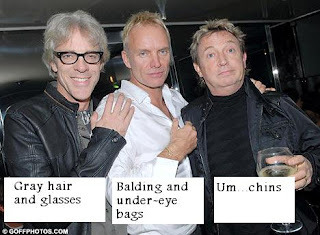 But usually, I can see the wax. I give his earlobe a gentle pull and, more often than not, I'll spy a gob that is screaming for me to pull it out. Though the last time I attempted to do that, I pushed it back in. Do you know how it feels to have an Otolaryngologist lecture you? I do. So, I have to settle for pulling the lobe back to just look. I am constantly peeking in there and making comments about his ear wax. Maybe I do it too often. Because when I was holding him the other night, he looked up at me and said, "Mom. You have some wax in your nostril." On yesterday’s Oprah, we met six individuals suffering from Obsessive Compulsive Disorder, also known as OCD. Though, if you really have this disorder, you know it should be referred to as CDO, so the letters are in nice, neat, alphabetical order. Dr. Mehmet Oz and Dr. Jonathan Grayson took these individuals to OCD Boot Camp, where they were forced to deal with their anxieties. Most of them had an aversion to being touched and to germs, so Dr. Grayson started them off with a group hug, so they could cross contaminate each other. Then Dr. Grayson had everyone get down on their knees, put their hands on the floor, and lick their fingers. Meet Brian. Brian was so afraid of germs that he constantly kept his left hand in his pocket, and he was so scared to sit on the toilet in his own home, that he would go to the bathroom in his yard. Dr. Grayson thought this wasn’t normal behavior and explained Brian’s course of therapy was to rub his hands along a toilet seat, and then lick his fingers. Because that is normal, and Brian needs to get on the right track. As you can see by the look on his face, Brian clearly wanted to stay on the wrong track. 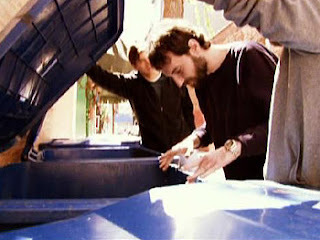 Next, the good doctors took the six people into Philadelphia where they found two sticky and smelly trash cans. One woman said they contained a mixture of cat feces, old food and vomit. Mmmmmmm. Dr. Grayson had Brian touch the inside of the trash can, then…you guessed it…lick his fingers. After the Boot Camp the participants said they felt much better, but they strongly felt that Dr. Grayson needed to get some help. After a lot of occupational therapy to get over some serious sensory issues, my six year old son is no longer afraid to touch anyone. He's also not real shy about it. When his sister started playing soccer and softball a few years ago, I would take him to practices where he would approach any Mom who paid him any mind and would begin rubbing her legs or arms. Not to mention, he would inevitably try to rub her chest as well. Thanks to some good fortune, last week our family got a Wii. What does a Wii have to do with chest rubbing? Well, I'll get to that. Aside from the fact that we warned the kids not to hurt themselves while playing their new video games...okay, that was after I pulled a shoulder muscle while bowling...we also told them never to touch buttons if they don't know what they mean. Because, so help me, if someone wipes out my Guitar Hero standings and I have to start over, it's not going to be pretty. Tonight, when I was folding laundry, my son saw one of my bras and asked, "Mom, is this for boobies?" I replied, "Yes. Yes, it is." Then, I realized we stressed being careful with the Wii a little too hard when he said, "And, I never, ever, ever touch private parts like boobies...and I never, ever press reset on the Wii either." Almost a month ago, my six year old son’s fingertip was smashed in a door and cut off. He was taken to the hospital, where the tip was reattached and we were told there was a 50/50 chance of it taking. It didn’t. Last week, after the doctor told us the tip would eventually fall off like a big scab, I explained to my son that his finger may look a little funny when all is said and done. He seemed a bit freaked out by the word “scar”…thanks a lot Lion King…so I had to think fast to reassure him. I pulled up my left pant leg and pointed to a scar on my shin, where thanks to a menacing 7th grade bully, I had the most painful wound of my life. I had just entered 8th period science class, and was approaching the teacher’s desk which was perched on a stage with metal trim all around the top edge. As I was passing said bully, he stuck his foot out and tripped me. At the place where two metal pieces joined together to form a perfect point, my skin was pierced. I fell, shin first, into the corner of the stage. The hole it left went nearly to my bone. I then showed him the bottom of my foot. My family had been tearing down my Grandmother’s garage, when I stepped down onto a board that had a long nail sticking out of it. The nail went through the sole of my shoe, right into my heel. My cousin and I went to the emergency room together, because shortly after I pulled off my bloody sock, she swung an axe directly into her shin. After that, I displayed the mark on my right forearm where I once slashed myself with a wallpaper scraper. It left quite a scar, because instead of going for stitches I wrapped up the wound with paper towels and duct tape. I explained to my boy, that although these things hurt at one time, the scars they left behind don’t hurt me at all now. But, by the look on his face, I don’t know if I reassured him or frightened him even more. Because I like to twinge in discomfort...tell me folks, what was your most painful injury? My daughter is begging us to take her to the new Narnia movie, but unfortunately for her, we rarely go to the theater anymore. My husband and I used to go to the movies all the time before our kids were born. Sometimes, two or more a week. Now we’re lucky if we see that many in a year. Given the fact that I could buy five days worth of groceries…or for crying out loud, ONE tank of gas, for what it costs to take our family to the theater, we tend to just buy the DVD and stay home to watch flicks. You know…where the screen is smaller, but the floor is just as sticky. It’s not only the money. I also like to stay home because I am a bit of a germophobe and I have a hard time sitting within the vicinity of someone coughing or sniffling. Plus there are talkers, and seat kickers, and people who need to get out of their aisle saying, “Excuse me. Excuse me.” There are popcorn munchers and wrapper crunchers, and occasionally some buffoon who forgot to set his phone to vibrate. But despite all that, there are some movies you just have to see 40 feet wide. The shark in Jaws, or the boulder rolling after Indiana Jones...well, they just don't look the same on a TV screen. One such movie was Saving Private Ryan. I will never forget the silence in the completely sold-out theater during the first scene. Twenty-four excruciating minutes of well-portrayed violence detailing the U.S. invasion of Normandy. Everyone’s eyes were glued to the screen and it turned out that was a good thing, because my husband made the biggest movie faux pas I’ve ever seen. He put the munchers, crunchers, and seat kickers to shame. As he stared wide-eyed and straight ahead, he picked up a Coke and drank it. Only it wasn’t his Coke...and it wasn’t mine either. And, when I leaned over to tell him he was drinking some stranger’s soda, he simply slipped it back into the cup holder, and the stranger was none the wiser. Considering the price of the tickets, I was actually glad he got a free drink out of the deal. What would you do if you were really trying to raise your children to be kind, respectful, compassionate human beings, and your six year old son sees two Muslim women at the doctor's office with head scarves, then he mistakes those head scarves for bandannas...and calls them both pirates? My husband is one of eleven children. He isn’t the first, second or third in line. Nor is he fourth, fifth or sixth. He is way down the line at number nine. There are so many great things about being married to someone from a large family. First of all, you’re never bored. There is always something to do and someone to do it with. There are loads of special occasions, card games and get-togethers. But, there are downsides to these events too. Understandably, seating is at a premium. One time when there were 45 people in my in-laws’ six bedroom house for an extended weekend, even floor space was valuable. You were lucky if you found a place to sleep where you wouldn’t get stepped on. I was not so lucky. And, what would you guess is the most precious commodity of all? If you have the misfortune of being in the bathroom when “soup’s on” is called…well, it’s possible you’ll just go hungry. If you’re not one of the first twenty people in line, then it’s a given you’ll find the mashed potatoes gone. And, if there’s chocolate pie for dessert, you need to claim your piece hours before mealtime. Growing up in this family has taught my husband not to waste food. You just don’t do it. When leftovers have been in the refrigerator a little too long, he will still eat them…even when they’re starting to look bad. And, he will consume bratwurst and baked beans for weeks after our July 4th party each year. I sometimes think his stomach is made of steel. I have noticed that he is rubbing off on me. I now make the kids eat their crusts, and I have even started eating yogurt that’s a couple of days past expiration, or the eggs when they are a few weeks old. But, there’s one thing he’ll eat that I just won’t. I have to draw the line at gray bacon. This is what brushing our dog looks like every spring. Once a week, we have a trail of fur stretching nearly the length of our coffee table. Anyone interested in purchasing some dog hair? Or, better yet...wanna buy a dog? Tomorrow is my son’s sixth birthday. When he was born, we didn’t know if he would live, so his birthday is a true celebration. The boy who came into this world seven weeks early, is now the master procrastinator. He will wait until the last minute to eat, get dressed, and my personal favorite…pee. The boy who was barraged with needles and tubes, and who hated to be touched or held because he feared it would be painful, now greets his friends with hugs each day. The boy who we never thought would talk, now sings and reads bedtime stories to us. The boy who didn’t walk until he was almost two, now runs, climbs, plays, and gives me heart palpitations when he jumps off the furniture. The boy who never wanted to eat, who gagged, choked and often vomited on his food, is now an unstoppable eater. We call his stomach the bottomless pit. The boy with the defective heart, now has more energy than his parents. The boy who frustrated me, now makes me laugh. The boy who failed in everything he tried to do, now can do anything. The boy who was weak, has taught me what real strength really is. Happy Birthday Boo. We are blessed that you were born. I take humor very seriously. To me, there is little doubt about its benefits. Laughter is good for you. My Dad is, hands down, the funniest person I have ever known. It doesn’t matter what you say to him, he will come back at you with one of his many bizarre, and often hilarious, catch phrases. For instance, if you ask him what time it is, he will reply, “Time for all dogs to die, don’t you feel sick?” He doesn’t say he’s going to get a haircut, but instead he’s “going to get his ears lowered”. And, if you ask him to do something when he’s lounging in a chair his reply will be, “I’m awful busy”. Imagine Steve Carell’s character on The Office saying, “That’s what she said”, but multiply it times infinity. My Dad has tons of these trademark lines. He has so many quotes, that he keeps them numbered “for emergencies”. More than a few of these have stuck. I find myself uttering his lines. At my former job I heard some quotes which I continue to use such as, “It’s so cold outside, you could snap an ear off”. And, instead of saying, “Give me a break”, one of my co-workers used to say, “Peel me a grape”. I find myself saying that every day. Not long ago a girl I know used the line, “Hot damn in can”, and now I say it too. Another thing I say quite often is, “For crying in a sink”. My husband’s family says, “For crying in a pop bottle”. But, my most frequent quote? Well, it makes me sound like I’m Jed Clampett. When something goes wrong I always say, “Dag-nabbit”. If I ever want to have a library as large as my Dad's I have a lot of work to do. So, I need your help. Boys and girls, I’m curious…what is your favorite phrase? 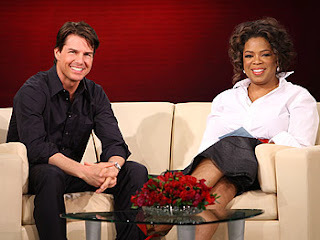 Yesterday, Oprah hosted Tom Cruise as they celebrated his 25 years in the film industry. It’s hard to believe, considering he looks like he’s fourteen. In the absence of couch-jumping, they discussed how perfect his life is. After he surprised a fan in the audience, it was time for the tables to be turned. Tom’s Hollywood buddies surprised him by making video clips to congratulate him on his career. First, Will and Jada talked about how “real” Tom is. Only, they didn’t call him Tom, they called him T.C., and those are not accurate initials, because Tom’s “real” last name is Mapother. That makes him kind of real…like pleather. Then, Jada explained how her hair had been chopped of in a bad weed-whacking accident. Next, the audience saw Renee Zellweger’s greeting. She told us how Tom was born with some kind of “magic”. Black magic. And in an uncanny twist, Renee declared her hair had also been chopped off by a weed-whacker. A video clip from David and Victoria Beckham revealed that when David opens his mouth to talk, he’s not as cute as you thought he was. Mr. Rogers called, he wants his cardigan back. Becks explained that he enjoys being Tom’s friend because they like to play a game called Guess Which Wife is Yours. After the show, Tom called the audience glib then went back to his perfect life. Last night, I attended a Police concert. 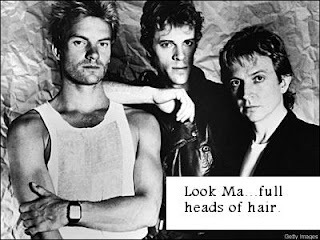 No Mom, not actual law enforcement personnel, but The Police…as in the band with a guy named Sting. Can anyone tell me what happened to the young fellas who once danced around on MTV? Because those guys are gone. Someone went and replaced them with three well-over-middle-aged men. And, you know what else happened? The audience went and got old too. The binocular rental booth was hopping, and if I had a dollar for every gray hair I saw, my family would be sitting pretty for generations to come. If I was a geriatric physician, I would have been handing out business cards. What’s really sad about the whole thing, is that it means I’m aging as well. For crying out loud, I walked to the show with orthotics in my shoes, and at one point I almost had to stop and stretch. Darn youngsters designing those long city blocks. But, as long as those boys keep playing, I’ll continue to wear my arch supports and dance…okay, sit. I forgot to tell you something about your boy last night...so we're laying down together reading a lovely Dr. Suess novel in bed...me thinking he was drifting off to sleep as we were on page 58 of this never ending rhyme, and all of a sudden your boy, out of nowhere, bites my nose (it was gentle - no need to panic). After I muffle my laughing because that is just such a typical thing for him to do, I asked him why he did it and he said because he wanted me to stop reading. So glad to see he uses his words! Of course as soon as I stopped reading he told me to read it again. I just thought I'd share, because I remembered it and started laughing again at work. This would be why we only hire babysitters who have a twisted sense of humor. That way, we know they'll fit right in. Does Two Out Of Forty-Two Pay Anything? Good thing Google Adsense pays me a whole $1.72 a month. UPDATE: I am in no way asking you to click on my Google Ad. That would be in violation of their policy and I can't condone that. Because if they pull it, how would I afford that half gallon of gas?